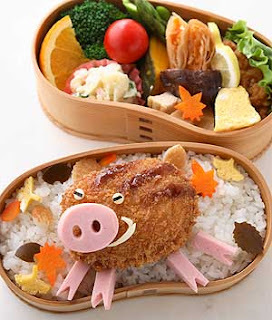 Blog of Swine: Buta no bento! 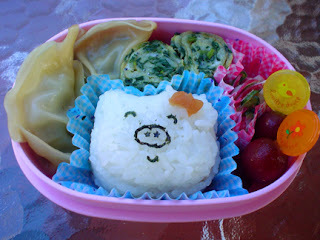 Some Japanese wives and mums (probably also husbands and dads) with too much free time put a lot of effort and creativity in preparing the lunch boxes - bento in Japanese - for their family members. There are people (nowadays not only in Japan) who have it as a real hobby, and create amazing works of art in those lunch boxes. One of them is the author of the blog Bento Corner. "Bu-ta-chan onigiri bento with gyoza, tamagoyaki, salad, and grapes. But. 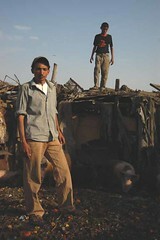 The pig. Is. Smiling." But then, mum suggested they could put a little ribbon on the piggy, and that made it less scary, and thus edible. These bentos give a whole new dimension to the rule used by some vegetarians and vegans - "I don't eat anything that has eyes."